« What Is Ice Road Trucking? What is a Jack-Knife Accident? A jack-knife accident is the name for an accident where the trailer exceeds a 45 degree angle relative to the tractor. The end result is that the tractor can’t rectify the sharp angle between itself and the trailer, and it usually ends up with the tractor at a 90 degree angle or greater relative to the trailer. A jack-knife accident is caused when the wheels of the trailer start to skin and the trailer begins to move faster than the cab. 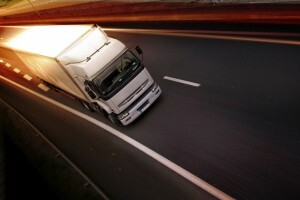 There are several factors that can cause a tractor trailer to jack-knife. Slippery wet or icy roads are the most common culprits in jack-knife accidents. The loss of traction can cause the trailer to slide out in one direction or another, especially if the trailer is empty and lighter. Hard braking can also cause the trailer to jack-knife if it doesn’t slow down in time. So how do truck drivers prevent the trailer from jack-knifing? The first step is to always be on the lookout for trailer swing. If the trailer seems to be moving out in one direction or another, let go of the brake and increase speed if necessary to pull the trailer back in line. If the tractor itself is jack-knifing, it may be because of sudden acceleration. Let go of the accelerator and steer out to regain control. Another way to prevent jack-knifing is to brake before turns instead of during turns, which prevents the trailer from going faster than the tractor. This entry was posted on Tuesday, December 17th, 2013 at 8:36 pm	and is filed under Tractor Trailers. You can follow any responses to this entry through the RSS 2.0 feed. Both comments and pings are currently closed.